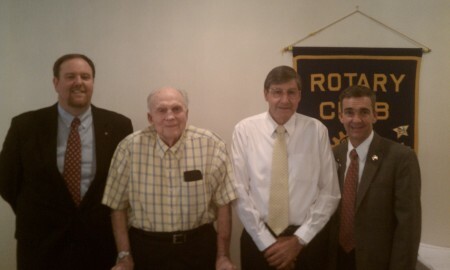 On July 10, Bill Hutto hosted Jim Dozier and Joe Haley. Jim Dozier shared experiences of World War II veteran Joe Haley and honored him by sharing with Rotarians the journey that Haley experienced during his service as a pilot in the army during World War II. Haley flew over 70 missions for the Allies against German occupied Europe and asked the club to honor those who were not able to return home from battle.